Jazz Search West 2018, the Bay Area’s Jazz talent search for adults and teens 15 and up, offers FIVE exciting competitions open to the public at East Bay Jazz venues during March and April. Contestants perform at the venue they choose, in front of a live audience and our panel of judges, all prestigious Bay Area Jazz professionals. 3 lucky finalists will be selected from each competition to move on to the exciting Semi-Final at the beautiful Freight and Salvage. 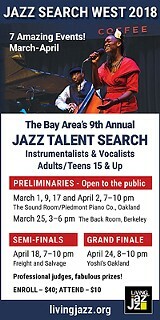 From there, 8 Finalists will move on to the Grand Finale at Yoshi’s Oakland, the East Bay’s premiere jazz club.